There is a raging battle of supremacy in our family for the grand title of ‘Queen of the Veggie Lasagna.’ It’s not as if we have any other ruling status to aspire to, unless of course it was The Precious Princess of Dunny Cleaning or The Lady of the Laundry. Perhaps we should aspire to the title of The Duchess of Finding Lost Shoes and Spare Socks? 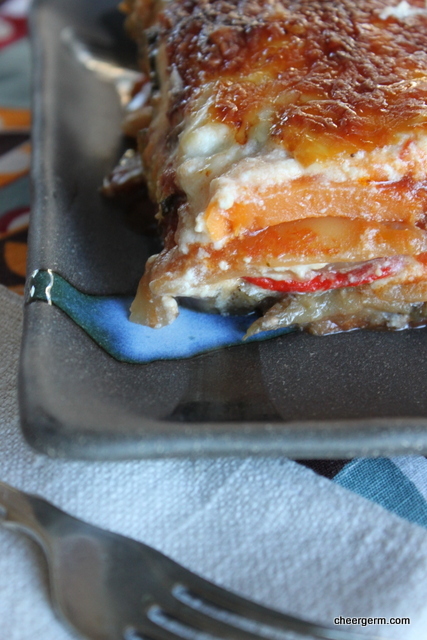 Battles aside, all of our vegetable lasagna versions have a different twist and they are all scrumptious. 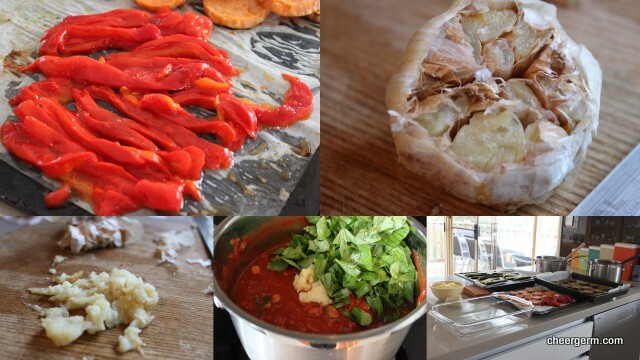 A lasagna is such a practical ‘big gathering’ dish as you are able to prepare it the day before you need it. Come the day of the party, you can smugly swan around the house preening and cleaning. Safe in the knowledge that the lasagna resides in stately grace, awaiting to be baked. In this case, we were enjoying a joint birthday celebration for Kid 2’s eighth birthday, as well as my birthday. (Thanks, turning 21 was tonnes of fun.) As such, I had prepared my Cheergerm veggie lasagna the day before. It ain’t traditional Italian, more a mixed breed of an old school lasagna and a hippy vegetarian version. I know that the grated apple and carrot in the tomato sauce is based on a vague memory I have of a Julie Stafford recipe from the healthy eating cookbook, The Taste of Life. This was a 1980’s cookbook that was well used by Mum back in ‘the day’. This lasagna is unctuous and hearty. The use of the ricotta in the white sauce gives it a lighter taste. Yes, it does contain a shedload of veggies and whilst it looks overwhelming, it really isn’t as much work is it at first appears. ( Ah, who I am kidding but it’s worth it!) There are a lot of photos in the post, I took the ‘step-by-step’ approach quite figuratively. Go figure. Preheat the oven to 200C (180 fan forced). 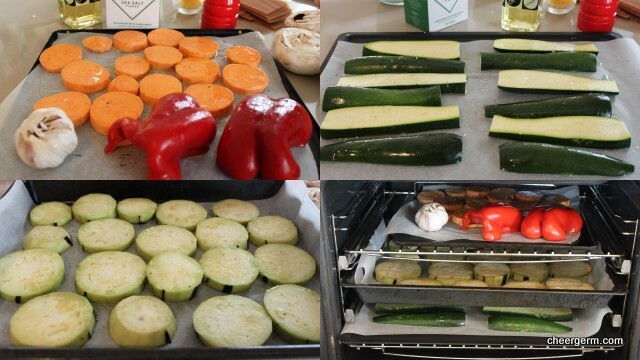 Cut the eggplants (I peel mine), sweet potato (peeled) and zucchini into one cm thicknesses. 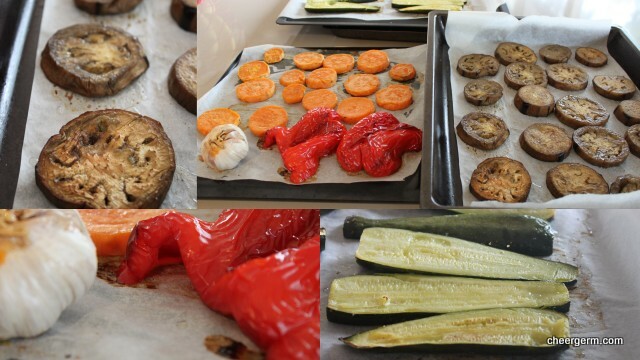 Place on trays lined with baking paper, oil both sides of the vegetables and season with salt and pepper lightly. Place halved red pepper and head of garlic onto a tray and drizzle with olive oil. Put the trays into the oven, turn the veggies over after 15 minutes, cook for another 10 minutes until the veggies are tender. You may have to leave the head of garlic in for another five minutes. Once the capsicum has cooled down, peel and cut into thin strips. Sauté onion in 2 tbl olive oil over medium heat until they start to soften, add the mushrooms and fry them until most of the moisture is evaporated. Add the sugo, tin of tomatoes, grated apple and carrot. Season with 1 tsp salt and some generous grinds of black pepper. Cook for about 45 minutes until the mixture has thickened and reduced. Check again for salt, it may need more. Take off the heat, add the torn basil and squashed up roasted garlic, stir gently. Melt the butter in a medium size saucepan over a low to medium heat. 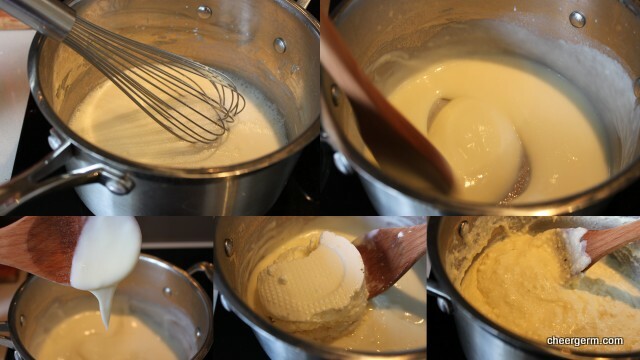 Add the flour and cook for 3 -4 minutes until the mixture (roux) starts to bubble. 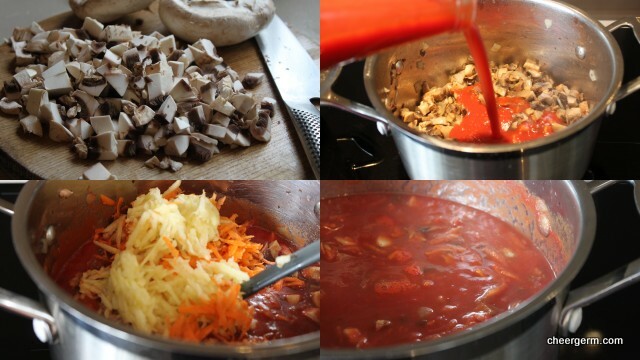 Put the sauce back on the heat and stir constantly with a wooden spoon until the mixture starts to thicken. Cook the white sauce for a few minutes, continuing to stir constantly. Add the ricotta cheese, pepper and taste for salt before adding any. 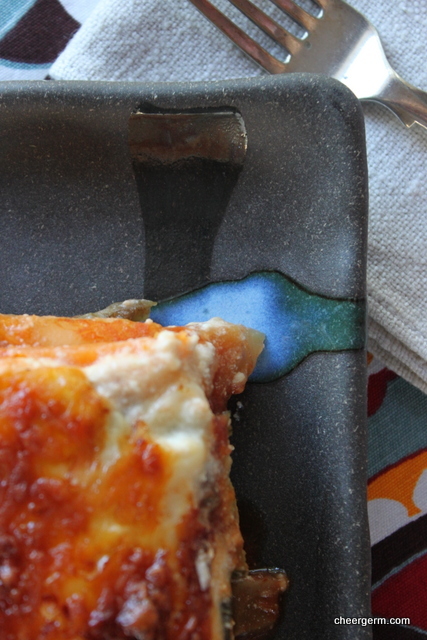 Oil your lasagna dish. I use a Pyrex, 3 litre dish. Place approximately five big spoons (a serving spoon size) of sauce on the bottom of the dish. Place 4 lasagna sheets on top and spoon on more tomato sauce, about 4 spoonfuls. 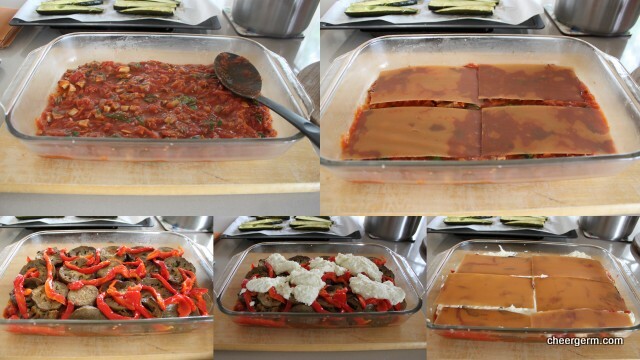 Put all the eggplant in a single layer, place the red pepper strips on top then layer on half of the ricotta sauce. Smooth it out. Place another layer of tomato sauce, around 4 spoonfuls. 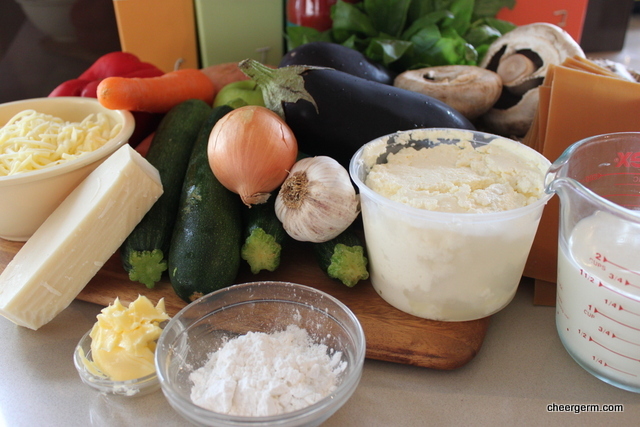 Spread the remaining ricotta sauce on top, then sprinkle with the combined mozarella and grated Parmesan. At this point you can place the lasagna in the fridge and cook later that day or the next. (When doing this, make sure you bring the uncooked lasagna out of the fridge for an hour before cooking, so it isn’t stone cold going into the oven.) If you are eating straight away, place in a 180C oven for approximately 45 min to one hour until golden brown and bubbling. Let stand for 20 minutes before serving. This helps the lasagna to re-solidify a bit and will be easier to portion and serve. Now you can lie down and rest for a day or two. Serving Notes: Serves 12. Best served with a simple green salad and crusty bread of some kind. 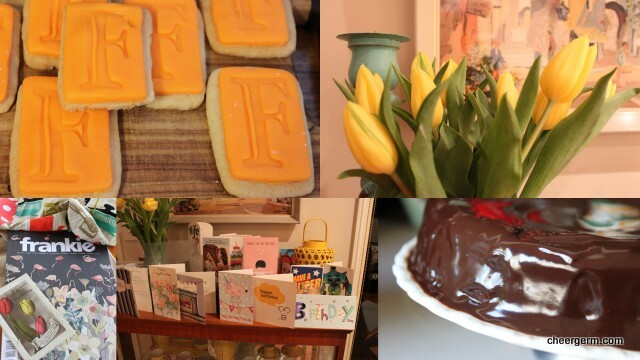 This entry was posted in Gluten free main courses, Vegetarian and tagged cheergerm, Cooking, Cooking for a crowd, food, gluten free, gluten free roasted vegetable lasagna, recipes, Vegetarian, vegetarian lasagna. Bookmark the permalink. Yes please to this lasagne! The nights are getting cooler in Johannesburg and this looks like the perfect comforting antidote! It’s delicious, especially good when you have leftovers for the next night! I agree, great comfort food as we slide into winter. You crack me up Mrs I, thanks! You probably really do have a ‘shedload’ of veggies at home! Drinking bubbly out of a coupe? I love it! As for the curry, it’s according to my mood. My family enjoy the classic chicken masala but I like doing variations with fish, lamb, pork….veggies. We don’t get many authentic ingredients in our parts (like fresh curry leaves) so I’m faithful to Patak’s curry paste! 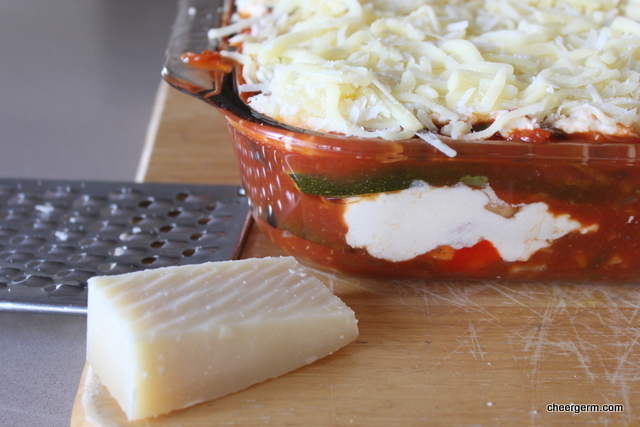 You definitely deserve the title of Queen of the Veggie Lasagne! I absolutely love this idea – particularly the ricotta topping (better than béchamel). So, happy 21st Queenie! What a celebration! And massive efforts made on behalf of someone’s hugely lucky and truly loved little boy–plus some self-love thrown in. Necessary, indeed. I hope there was a crown in the pile of gifts you surely received. There is no doubt, I’d have you ruling over my kitchen kingdom in a heartbeat. Love the addition of the green apple – I’m curious to give it a try. Bet it brightens the sauce beautifully. Happy b-day, Cheergerm, to you and yours! Hands down, it looks as though it was wonderfully worthy. OMG. Your family must be so spoiled by all your delicious cooking. Thank you for this….it looks wonderful! Ahhhh, yet another recipe that looks lovely, and I would love to make it and eat it, but the whole rest of my family will rebel. It’s my husband’s fault. He was raised on soggy broccoli and canned corn, with no salt, butter or garlic… nothing to make his veggies tasty. Now he sets the example for my children that it’s totally okay to eat no vegetables. I have to chop them up really tiny and put them in places they’ll never look. My son is better. He has actually tried the veggies I make, broiled brussels sprouts, carrots, sweet potatoes, broccoli, squash (no one else will eat that), and knows they taste good, but husband and daughter? They will allow nothing green past their lips. I lie to them about the ingredients in their food. To this day, my husband thinks he hates onions. Ha! They’re in everything he eats. You crack me up Naptime! You sound like Yu have two ‘die hard veggie haters’ in your midst. That’s pretty darned tricky my friend. Your son sounds a bit easier, it’s about just getting them to try a little bit which doesn’t always work, of course. My boys don’t overly love this lasagna but they will eat vegetarian versions of bolognese sauce and vegetarian tacos etc. They can still reel off a list of veggies that they hate. Rest assured that I too still hide veggies….I zshoosh them up in the food processor then add them to mince for my hamburger patties. Kid 1 swears he hates onions too…but they are in everything….even my cakes….nah, not really….I once made this uber healthy version of a ‘caramel mud cake’ using roasted sweet potato. It was hideous and the boys have never forgotten or forgiven…’remember the day when…’ maybe you could cook them that cake then the next time you serve something green, they will be really grateful it wasn’t that bloody awful cake! Or just make the lasagna for yourself, eat some, freeze the rest in ‘mummy naptime easy dinner nights when the rest of you can get look after yourselves’ portions. !? Well happy belated birthday love!! I remember the Julie Stafford books. I have one of them tucked away somewhere. That lasagna looks delicious, Cheery. Hard work, but as you say, worth it. 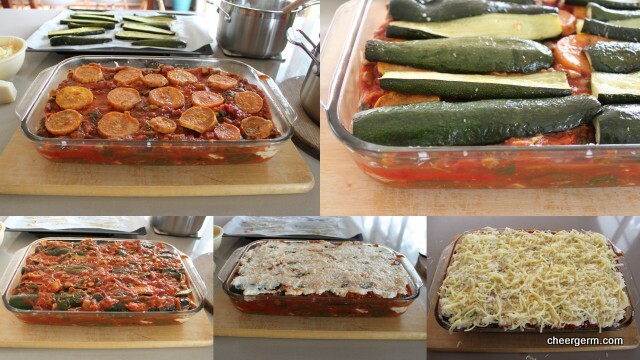 Sounds like a girl thing – Jennee likes to think she is queen of the vegetable lasagne. No joke. There could be a cook off brewing there one day?? Thanks Mr Food! Maybe we have stumbled upon an unknown vegetable lasagna phenomena. Being that all chicks who make veggie lasagna undergo some kind of transformation into Queendom. (Or at the very least, thinking they are reigning monarchs?) 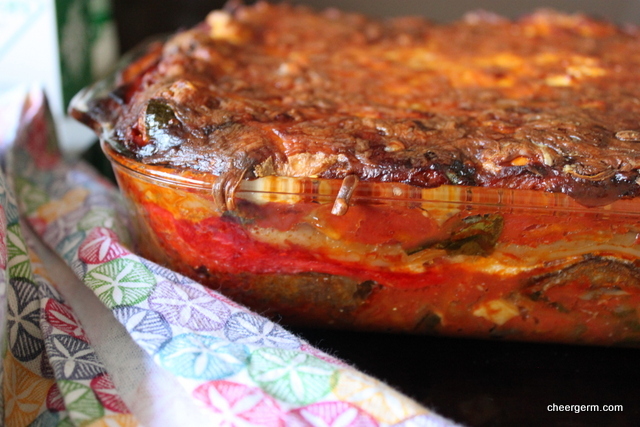 A Vegetable Lasagna Smackdown!? (Whilst wearing tiaras?) Now there’s a thought…. Not quite that far lately, would like to ‘in da future’… ya’ll ever get to Sydney?